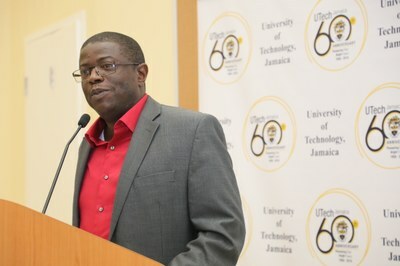 UTech, Jamaica Press Launches First Book — UTech, Ja. Dr. Adella Campbell, (2nd left), Head, Caribbean School of Nursing, University of Technology, Jamaica and author of the first book published by the UTech, Jamaica Press, titled “The Jamaican Public Health System From the 17th – 21st Centuries – A Policy and Structural Perspective” celebrates the launch of the book with the symbolic unveiling of a large replica of the book’s cover at a special book launch ceremony hosted by the UTech, Jamaica Press on Wednesday, November 28, 2018 at the Shared Facilities Building, Papine Campus. Sharing in the occasion from left are friends of the author, Daniel Dawes, Consultant, Tourism Product Development Company Limited, Rosemarie Ancel, Nurse Anaesthetist, Mandeville Regional Hospital and Professor Stephen Vasciannie, President, UTech, Jamaica/ Chairman of the UTech, Jamaica Press Editorial Advisory Board. 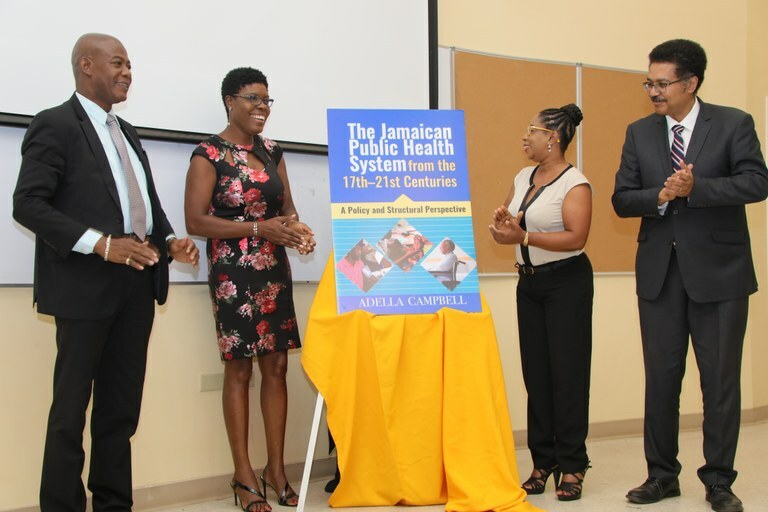 The University of Technology, Jamaica Press has launched its first book titled, The Jamaican Public Health System From the 17th – 21st Centuries – A Policy and Structural Perspective authored by Dr. Adella Campbell, Associate Professor and Head of the Caribbean School of Nursing, College of Health Sciences, UTech, Jamaica. 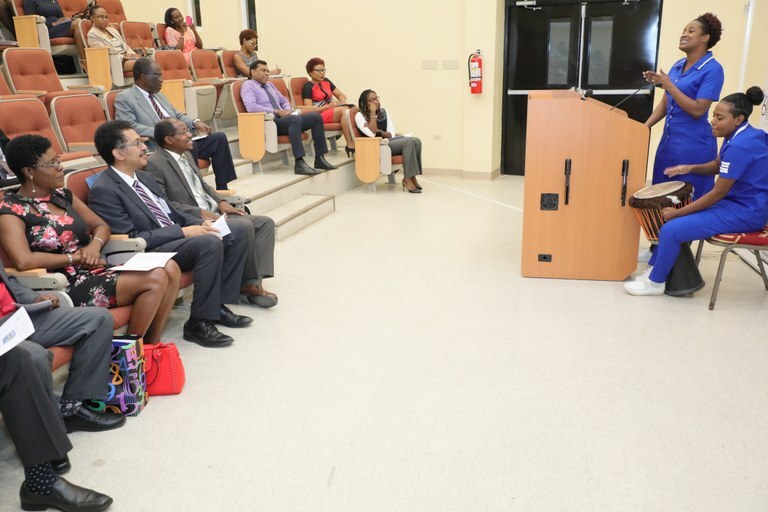 The Book was officially launched at a special ceremony held on Wednesday, November 28, 2018 at the Shared Facilities Building, UTech, Jamaica Papine Campus. The book is an in-depth exploration of the health care system in Jamaica over four centuries. It provides insight into the delivery of healthcare services to the Jamaican citizenry set within the context of Jamaica’s own development over the period, from the plantation system into the 21st century. A large gathering comprising leaders in the nursing and health care fraternities, educators, students and other well-wishers came out to witness the historic moment in the life of the University which is this year marking its 60th anniversary. 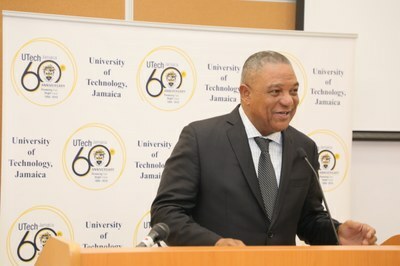 In extending hearty congratulations to the author, the President said that the Press has been established primarily to provide “a ready and accessible outlet for University members to venture into the publishing world.” He pointed out that the UTech, Jamaica Press seeks to publish books not primarily on the basis of likely, although desirable profitability, but rather with preference to the quality of the book. 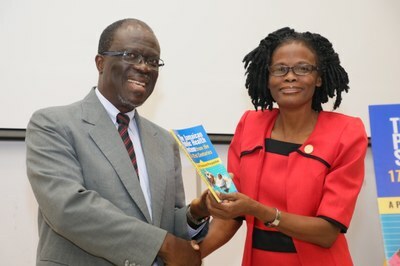 Professor Vasciannie whose formal endorsement appears on the back cover of the book praised Dr. Campbell for her “insightful bird’s eye view of the public health system in Jamaica.” He noted that “her historical approach – ranging from the Columbine period to the present – should provide valuable guidance to all stakeholders in the Jamaican health care system.” The President encouraged purchase of the book which he said should inspire others to write and to publish their work. Minister of Health Dr. Christopher Tufton whose endorsement also appears on the book’s back cover, has noted that “as we seek to improve and modernize Jamaica’s public health care system, it is important to have an understanding of its roots and precedents. This book by Dr. Campbell is a timely contribution to the literature,” the Minister wrote. 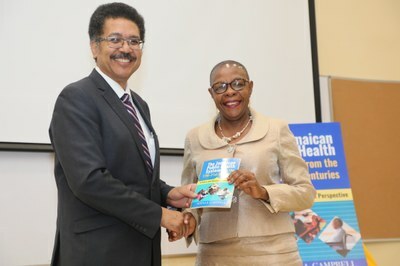 In her remarks at the launch, Dr. Adella Campbell offered profound thanks to her colleagues, members of her family and friends who supported her in the journey to the realization of the book which stemmed from her 2013 dissertation on the Jamaican public health system, while she was a Commonwealth Scholar in New Zealand. Dr. Campbell said her research interest was motivated by the dearth of published work on the development of Jamaica’s public health system. She noted that the text elucidates the policies and structures which form the core of health infrastructure from one century to another. 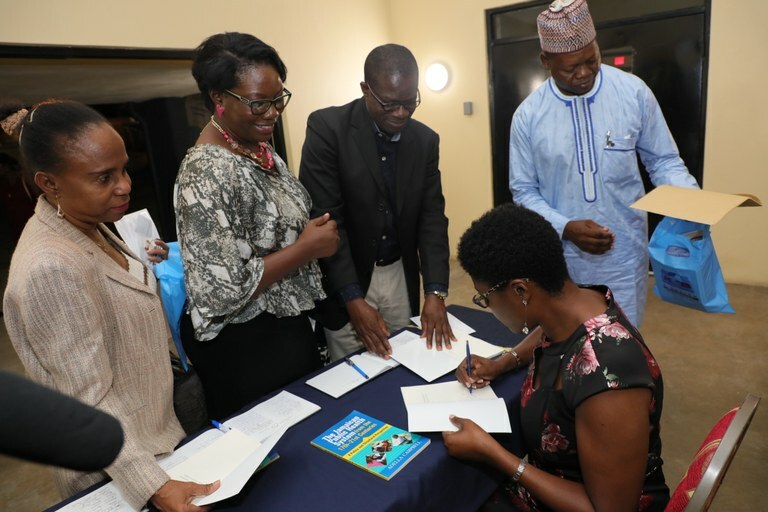 She highlighted the expected usefulness of the book to health practitioners, students, scholars, policy makers and the general public. 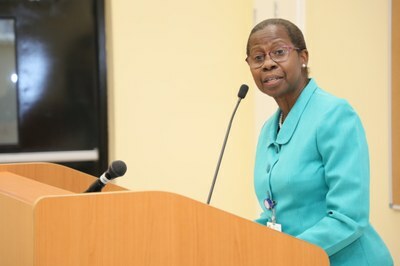 Dr Campbell specially acknowledged Professor Stephen Vasciannie as one of the main “drivers behind this work.” She noted that Professor Vasciannie, who was among the panellists interviewing candidates shortlisted for the Commonwealth Scholarship in 2008, both challenged and encouraged her to pursue her research work on the Jamaican public health system. Dr. Campbell also expressed gratitude to Dr. Katherine Nelson and Professor Jackie Cummings her research supervisors from the Graduate School of Nursing, Midwifery and Health, Victoria University of Wellington, New Zealand; Dr Eugenie Brown-Myrie, former Dean of the then Faculty of Health and Applied Sciences, as well as a host of current and former UTech, Jamaica colleagues and supporters from the nursing and health fraternities. Mr. Horace Dalley addressing the book launch ceremony. 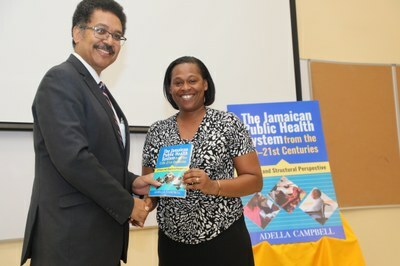 Ahead of her remarks, Dr. Campbell was introduced by her Member of Parliament and friend, former Minister of Health, Mr Horace Dalley, MP, Clarendon, who shared snippets of the author’s academic journey and her fortitude and determination to succeed despite occasional challenges and setbacks which included her completion of high school with only a single passed subject. Guest speaker, Mr. Everton Anderson, Chief Executive Officer, National Health Fund. Guest Speaker was Mr. Everton Anderson, Chief Executive Officer, National Health Fund. He noted that the book captures much of what has happened in Jamaica’s public health system and serves as a reminder of how far Jamaica has come. He congratulated Dr. Campbell on her published work and underscored the importance of Jamaicans documenting our history by writing our own stories. Dr. Janet Campbell Shelly, Dean, College of Health Sciences. Other speakers on the programme were Dr. Janet Campbell-Shelly, Dean of the College of Health Sciences who in congratulating the author, noted that the book will be “an asset to not only the nursing fraternity and the health sector but to Jamaicans at large;” Dr Audrey Gittens, Lecturer, Caribbean School of Nursing who introduced the guest speaker; Mrs Audrey Dawes-Jarrett, Chaplain, UTech, Jamaica Western Campus who offered prayers and Dr. Kamilah Hylton, Dean, Faculty of Science and Sport/ member UTech, Jamaica Press Advisory Editorial board, who ably . chaired the launch ceremony. The book is available from Kingston Bookshop and Bryan’s Bookstore Limited. Dub Poets’ Tribute to Dr. Campbell: College of Nursing duo, fourth year Bachelor of Science in Nursing, students Sherae Douglas (at podium) and Shannae Gayle perform a well-received original dub poetry piece in honour of Dr. Adella Campbell’s achievement, much to the delight of the audience. Professor Stephen Vasciannie, (left) President, presents copies of the first book published by the UTech, Jamaica Press to (from left) Mrs. Kerry-Ann Rodney Wellington, Head, Instructional Media Service, Calvin McKain Library, Dr. Audrey Gittens, Lecturer, Caribbean School of Nursing, UTech, Jamaica and to Dr. Steve Weaver, Head, School of Nursing, University of The West Indies, Mona Campus. 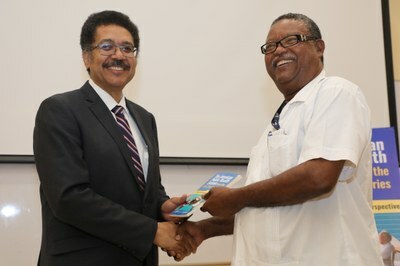 Mr. Martin Henry, Manager, Projects and Operations, School of Graduate Studies, Research and Entrepreneurship/Project Manager, University Press presents Ms. Carmen Johnson, President of the Nurses Association of Jamaica with a copy of the book. Publications were also presented to representatives present from the Ministry of Health, Regional Health Authorites, the School of Nursing at the Northern Caribbean University and the Department of Nursing at Excelsior Community College, Knox Community College and Brown’s Town Community College. Guests purchasing copies of the book from representatives, Kingston Bookshop Limited following the launch ceremony.